Last Saturday was the perfect day to be in New York's Central Park. The winds were calm, the temperature was in the 50s and the park was filled with people enjoying the day. What I love about New York is that anything can happen and once in a while you can see something that will warm your heart. 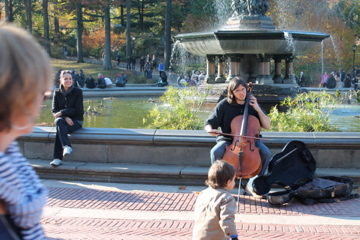 This is sweet...a small child enjoying music and onlookers enjoying both. As we walked past the fountain we noticed the man taking photos so we of course did the courteous thing and started to walk around him...then my daughter noticed what we were witnessing. A marriage proposal-- right there in the middle of the courtyard by the Bethesda Fountain. Friends were holding signs that read..."will you marry me?" and he was even on bent knee with a box holding a ring. So sweet. We could not believe our timing. You don't get to see something like this everyday. So sweet - what a fun thing to see!! this just made my night. how awesome that you got to witness such a personal, loving event. what luck annie! Oh my gosh! That's awesome you got to see that!! Great images! Last time we were in NYC, (2yrs ago) Hubby and I just sat on the steps of the MMA, people watching..Thanks for bringing that wonderful memory back! That is SO romantic and cute! What a great guy. I love NYC! 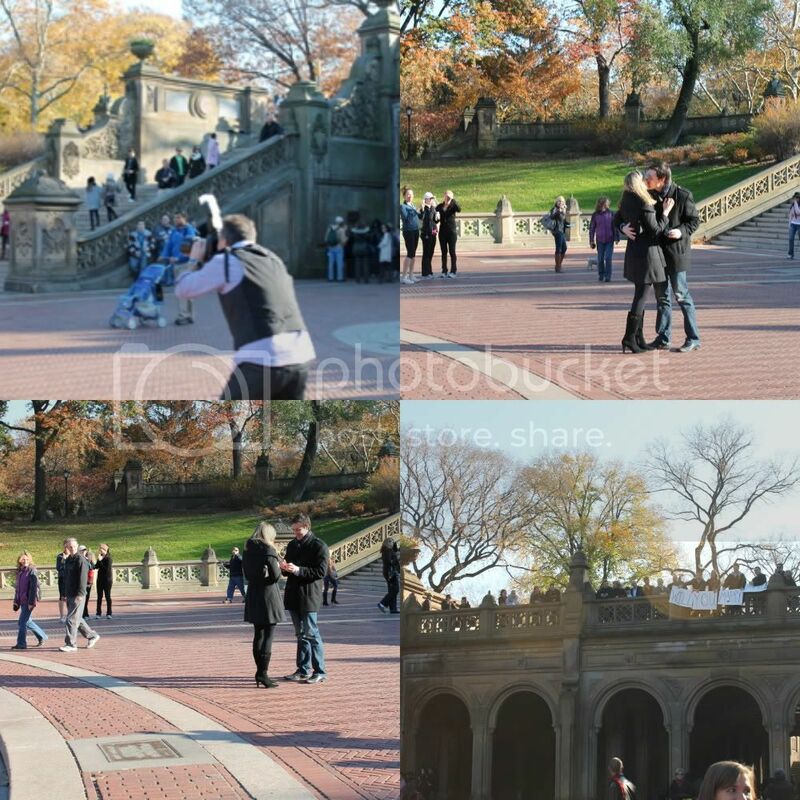 Especially Central Park…it is good luck to witness a marriage proposal (successful one that is)! Wow, how amazing to witness a proposal, and especially in Central Park. So cool! Very sweet. I miss my people watching days. ohhh what a nice way to ask!! Very sweet! I think that the right word in English is to propose not to ask! Of course, part of me wants you to say there was a flash mob as part of his proposal... lol. What a perfect timing! That guy is so sweet and I love his efforts! Love & Happiness in Central Park! A Lovely Thing to witness!! Awww that's so sweet! What a great place to get engaged too! You need to find them and send them this picture in case they don't have one. How sweet. Central Park is the perfect place to people watch. Happy weekend.